Great episode of LOST last night. Finally got some insight into what the numbers mean. Went to the Laurelhurst Theater tonight to see "The Men Who Stare At Goats" for a mere $3. Not only that but its a brew and view theater meaning they serve glasses and pitchers of brew. Mmmm... and pizza. Afterward I came home and room-o's put in "The Invention of Lying" which was hilarious. A+ film. Going to the Laurelhurst tonight was the first movie I've been to in a long long time. I have been filling my day with applications and settling in. I need a couch. Something to sit on instead of the floor. Soon... soon. 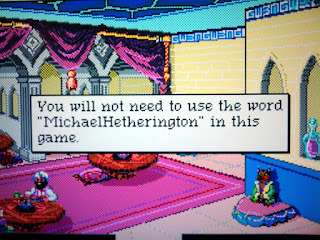 This image comes from Quest for Glory II, an old school PC game. It was released just before point and click was gaining popularity so it's mostly typing actions in with a lot of trial and error. Obviously, it didn't like this command. Quest for Glory IV was much better. I also recently picked up the 4th and 5th installments of the new Secret of Monkey Island. These two episodes will complete the saga. This is one hell of a fun game. Humourous and sweet, I have loved every minute so far.